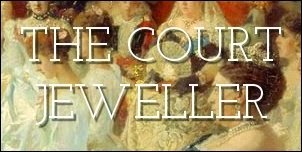 If you've read this blog for any length of time, you know that the Queen's brooch collection is absolutely packed with sentimental and important pieces that belonged to her mother, Elizabeth Bowes-Lyon. Today's brooch is one that the Queen Mum received during her long widowhood, and that the Queen has begun to wear regularly since her mother's death. The Hibiscus Brooch, set with diamond and rubies, was given to the Queen Mother by the people of Australia in the 1950s. The hibiscus is an important flower in Australia -- so important, in fact, that the nation even has an Australian Hibiscus Society. The brooch features two of these hibiscus flowers entwined. Above, in perhaps the most Aussie-themed photo of the Queen Mum ever taken, she wears the brooch while cradling a koala during her 1958 visit. The brooch was inherited by the Queen after the Queen Mother's death in 2002, but she didn't wear the piece in public until four years later. The occasion was a significant one: Prince William's passing out parade at Sandhurst. Since then, the hibiscus has been a fairly regular part of the Queen's brooch rotation, most often appearing when she wears red or pink outfits.